A DIY calendar that is both artsy and practical! 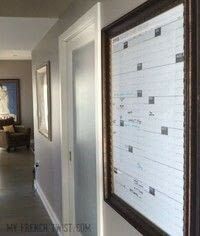 https://www.cutoutandkeep.net/projects/diy-dry-erase-calendar • Posted by Wendy R.
Best. Calendar. Ever. 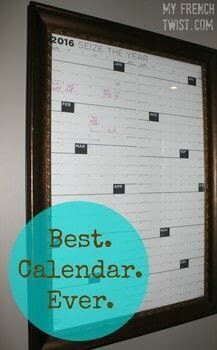 This gigantic, dry-erase year-at-a-glance calendar is not only functional but super chic. And it is, hands down, the best organizing tool you'll ever have! 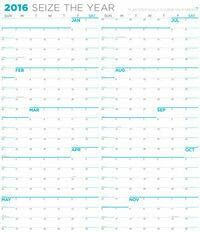 First, you will need a large, year-at-a-glance calendar. I purchased a 27"x 39" paper one from NeuYear.net. Next, I found an inexpensive frame on sale that had a slightly rustic flavor. I had to trim the calendar down slightly to fit. Then I hung it in my hall. Since I walk past it many times I day, it is a natural reminder to me of all our household events. Here's the really cool part. I keep several dry erase markers on top of the frame for jotting down reminders. I've even designated different colors for different family members! You can write directly on the glass; it wipes off easily.